My sugar ball in the middle. 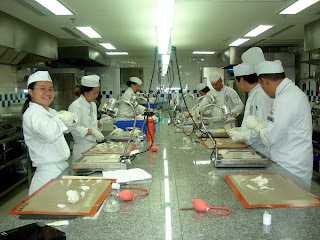 I managed to blow a sugar with the help of the chef. 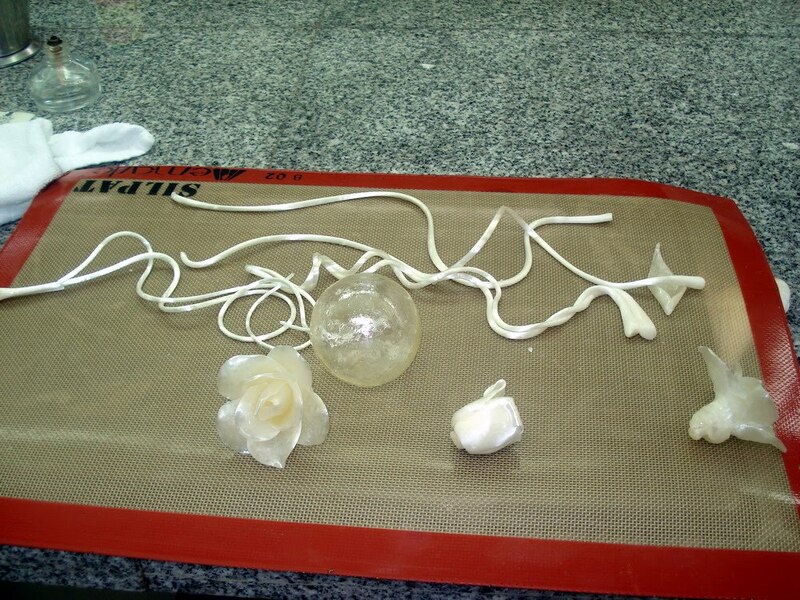 I also practised making some flowers in preparation for the sugar showpiece exam. 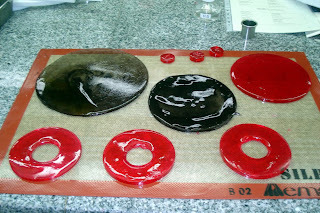 The same recipe with blown sugar is used here. 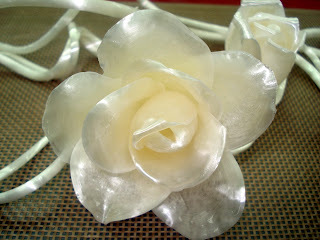 For starters, my class were encouraged to make at least one rose. I struggled doing it and ended up making a different kind of flower. 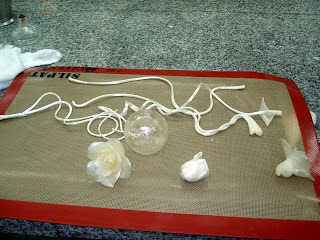 How to pull sugar roses? Hold a small amount of sugar between thumb and forefinger and pull to the sides until you get a thin layer of sugar. Use the thumb and forefinger to pull the shiny edge and cut it with scissors.. Press the edges together. This will be the center of the rose or flower. Repeat the pulling to make more petals. Attach the petals around the bud to create flower. 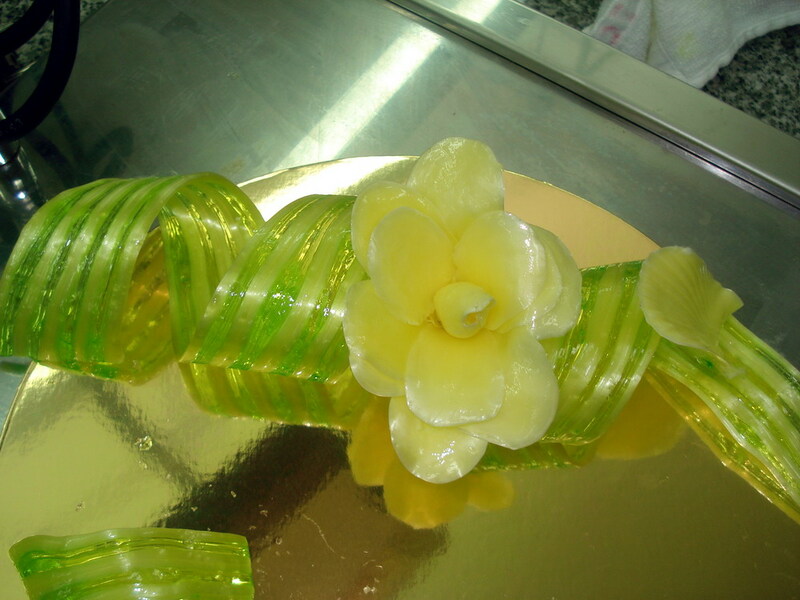 To make pulled sugar ribbons, take two small amounts of pulled sugar. One is shiny, the other dark. Roll them into strips. Lay them next to each other.Fold them back and forth and stretch while folding them. Repeat the process until the required shade and glosiness are obtained. If sugar is undercooked or when more tartaric acid is added than what is required, the candy syrup will not properly harden when cooled. see below. 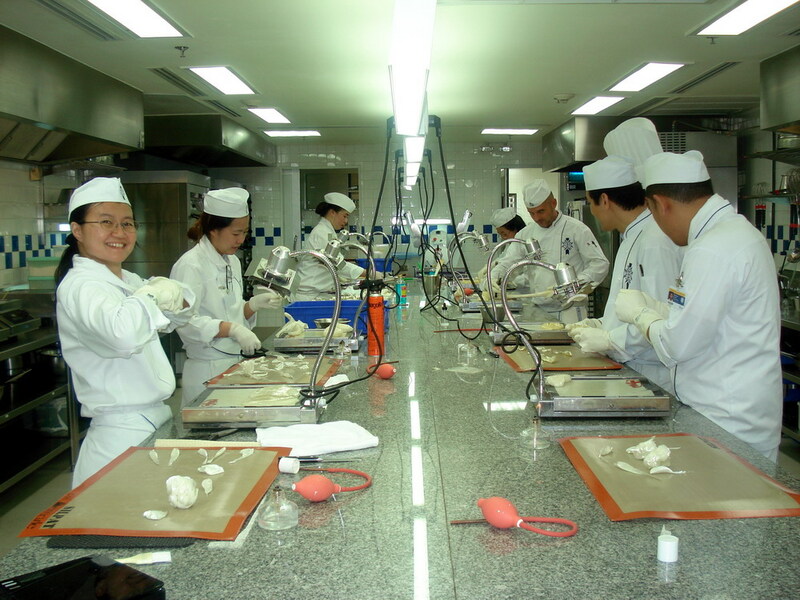 The least complicated method in sugarwork. Poured sugar is heated candy syrup poured into casting bars which give its shape. This serves as the base of the sugar showpiece. I didn't quite perfect my technique but I will try to do better next time. 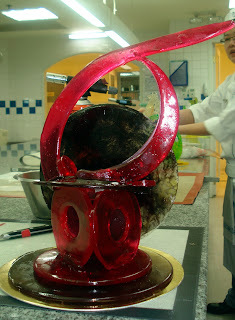 Wow amazing but what is the recipe for the ball and roses ?! Thanks. If you don't mind giving your email, I'll send the recipe to you.